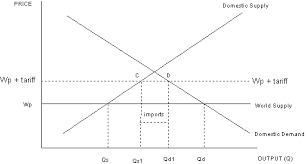 One of the concepts that the McKinley tariff brought into view, historically speaking, is the concept of protectionism. Tariffs are fiercely related to protectionism. Governments sometimes adopt a protectionist attitude in order to boost domestic production without competing in the global market. It’s a method of developing economies, providing jobs and creating goods that are long lasting and worth selling. Consumer demand ultimately dictates the direction of the market, but pricing is heavily connected to the costs of transport. One of those costs, one of the most significant costs, is the tariff. Tariffs are taxes placed on foreign goods that enter the country. Tariffs basically accomplish two end-goals: they provide revenue and protect domestic manufacturers. At the end of the Civil War, tariffs were a convenient and easy way of getting money. America was developing at a rapid pace and imports were up. The government quickly found itself sitting on a reserve and came to an impasse as to how to deal with that. Democrats wanted tariffs lowered, which they claimed would reduce revenue. Republicans wanted tariffs raised, which would reduce foreign trade and ultimately the revenue from tariffs. With a majority in both houses, and a Republican President Harrison, the Republicans won out. So, did the Republican plan work? Douglas Irwin, a leading economist, claims… almost. Revenue decreased by about 4% historically, but the elasticity of import and export demand painted a different picture. One good example is the reduction of duties on raw sugar. Sugar was a high revenue producer, so cutting the tariff on that product led to a natural decrease. If we recalculate the demand without sugar involved, the revenue actually increased by 7%.